Local. Handmade. Artisanal. From soap to jam to wine, those words, as applied to some of our everyday purchases, evoke the modern and trendy even as they harken to an earlier, simpler time. While hand-forged cabinet hardware and other metalwork aren’t necessarily everyday purchases, those words reflect the art of the metalsmith and the blacksmith with hammer, tongs, and anvil, turning iron, carbon, and heat into tools, door handles, light fixtures, and furniture. 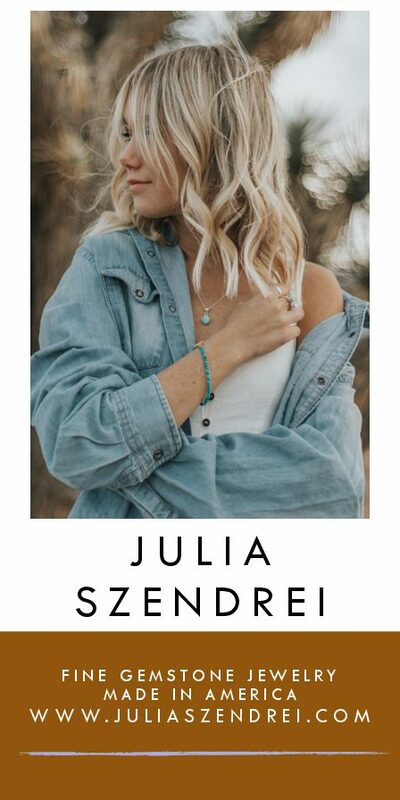 In the case of four small, Montana metalworking businesses, creating that which is carefully wrought and not bought in machine-made packaging from an anonymous store has tied them in closely with the local, artisan, handmade movement. And the act of creation has had transformative effects on both the artisans and their customers. 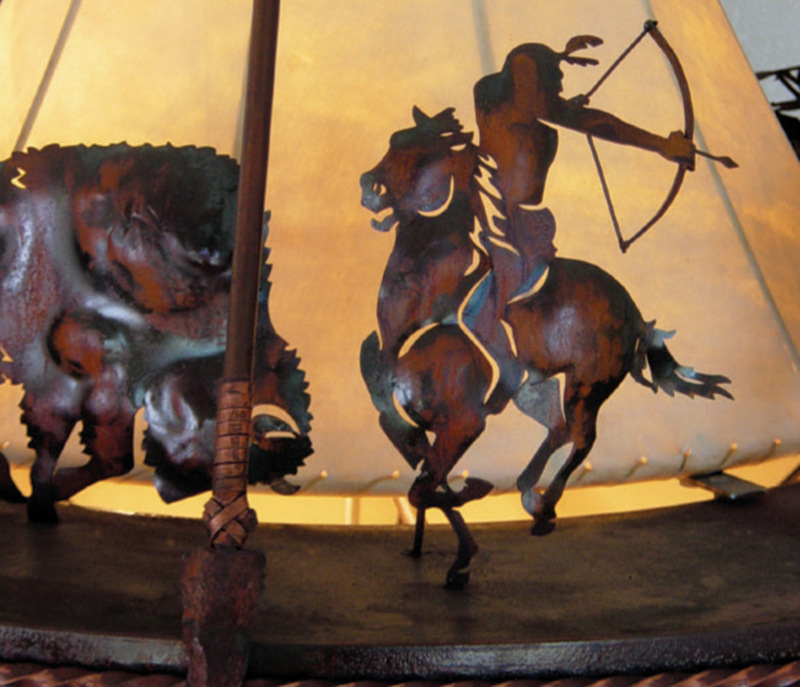 Marcus Lilley, of Fire Mountain Forge in Livingston, Montana, a company that specializes in hand-forged (and UL listed) metal light fixtures, but also makes mirrors, stair railings, and other decorative and functional hardware, thinks that choosing the right lighting can be critical to the overall design of a home. He said he has “literally walked into bigger, high-end homes and seen generic lights that totally ruined the house. The craftsmanship and the quality of the lights can really make or break the design of a home.” In the case of the lighting fixtures offered by Fire Mountain Forge — a product line that came about when clients of Lilley’s aunt and uncle’s electrical contracting business requested something different from what they were finding at the big box stores — clients can choose from several product lines and styles, including Old World chandeliers, Western ranch fixtures, and even safari-themed items, or they can commission custom work. 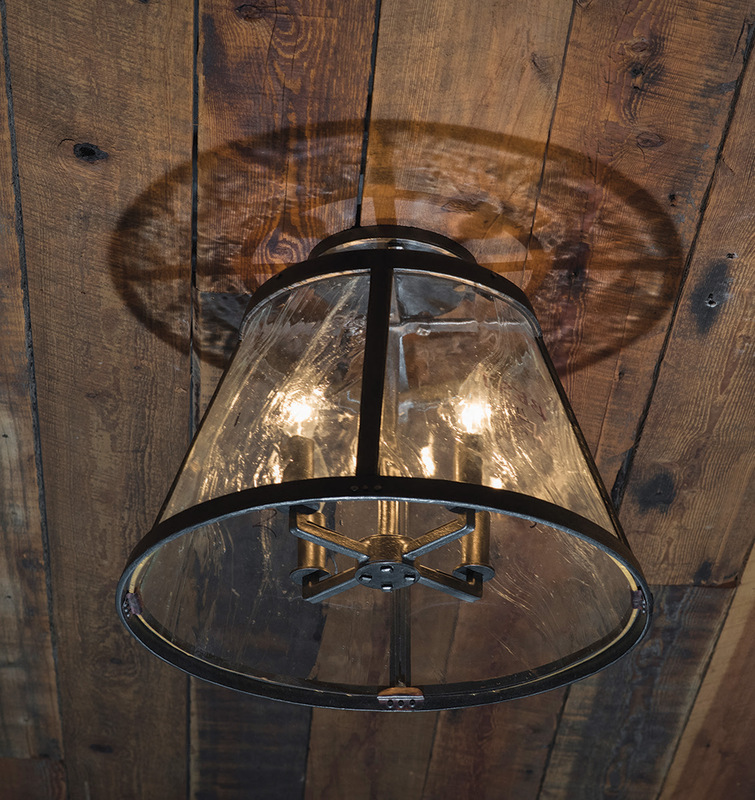 All are meticulously hand finished, are paired with glasswork that complements the warmth of the metal patina, and merge seamlessly with the home designs they are chosen for or commissioned to fit. Former Bozeman, Montana, police officer Chris McKeague, now the owner and metalsmith behind Iron Horse Design in Bozeman, shares that fascination with the process, and shapes his designs to find a perfect melding of form and function. McKeague got started in the business when he purchased his first home and started building his own metal and wood furniture in the garage to furnish it. After making pieces for friends and family, he started taking on clients and now has a mix of residential and commercial projects to his credit, from outdoor signage to shelving to tables and chairs. McKeague is also getting ready to launch a ready-made line of smaller pieces under the name Bridger Hardware, planning that collection to include everything from cabinet pulls to brackets to coat racks. His interest in industrial design and functionality comes through in the clean, modern lines of his work. Everything he produces is designed to last, and he strives for a timeless aesthetic. But there’s whimsy in his work, as well. “I like to think I walk the line between creativity and specific needs,” he said. Form with function also informs the work of Glenn Gilmore of Gilmore Metalsmithing Studio in Hamilton, Montana. Gilmore labels himself a blacksmith/artist, and his national and international awards from more than four decades of work with metal stack up to underline that fact. Gilmore will travel to a site to get a vision of how it should look, then make and install 10,000 pounds of metal built to precise specifications. He views his work as a collaboration with his clients, and after more than four decades said he’s still in love with the work. “I’m passionate about it. I like to be able to do what I do and create what I create. It’s very demanding,” he said. “If you’re pushing yourself, you’re always learning.” His work includes stair railings that evoke an estate-like grandeur, soaring gothic arches between carved newel posts, and sticks and branches entwined with delicate oak leaves and acorns. There is an Old World feel about Gilmore’s work, but a contemporary freshness as well. And his commissions grace homes from Wyoming to Connecticut. Gilmore uses the highest-quality recycled materials available, working in numerous metals, colors, and finishes. His custom-made fireplace tools, screens, and stair rails grace their settings like expensive jewelry with a designer gown. From custom stair railings to fireplace screens to pot racks to furniture, the hand-forged pieces these artisans build in their studios and workshops are built to last, and feature intricate and personal details. 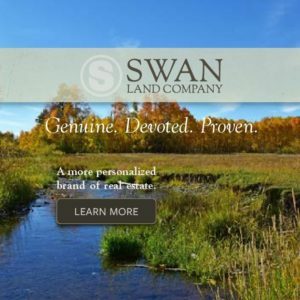 The homes that incorporate their work bring the manufacturers and the homeowners pride, satisfaction, and quality of life. 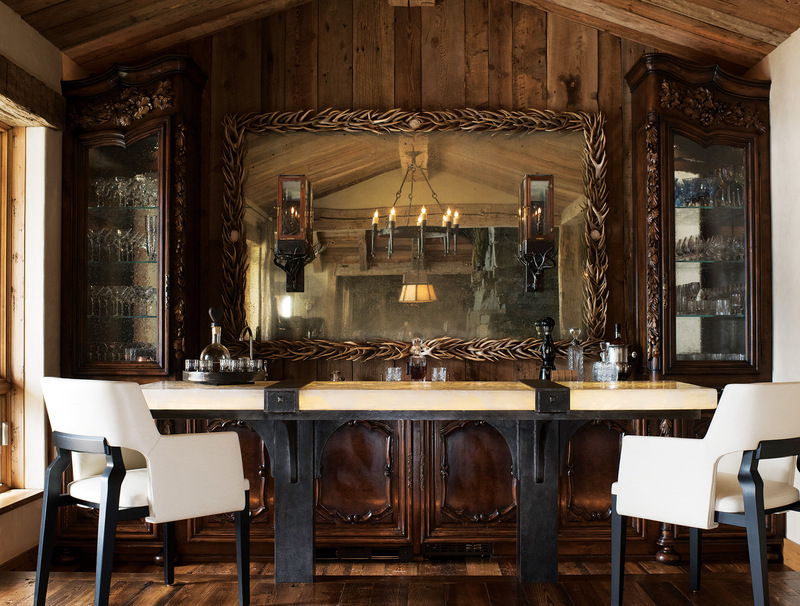 While it is more challenging and expensive to acquire these locally-made details for a home, the timelessness of these pieces — handmade with pride — makes them a great value when planning a dream home or exquisite luxury escape. The hours that these artisans devote to their products, and the personal care they put into each piece, guarantee that the item made just for you (or the piece made from their affection for the work) will last a lifetime. In design, it’s the little things. But it’s also the big things. When the two work together, bringing functional art to life by melding it with architectural surroundings, the magic of the handmade, the artisanal, the unique makes a whole that’s greater than the sum of its parts. It can take a bit more effort to seek out the special details that will complete a home — but the satisfaction in the results will last for years. 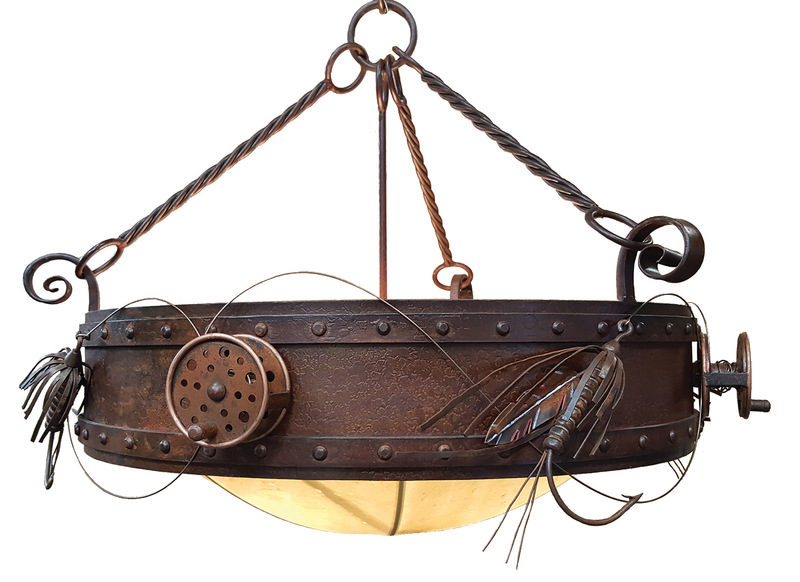 Fly lines unfurling and bowstrings pulled taut show how much movement can be achieved through the artistic shaping of metal in these light fixtures by Fire Mountain Forge. 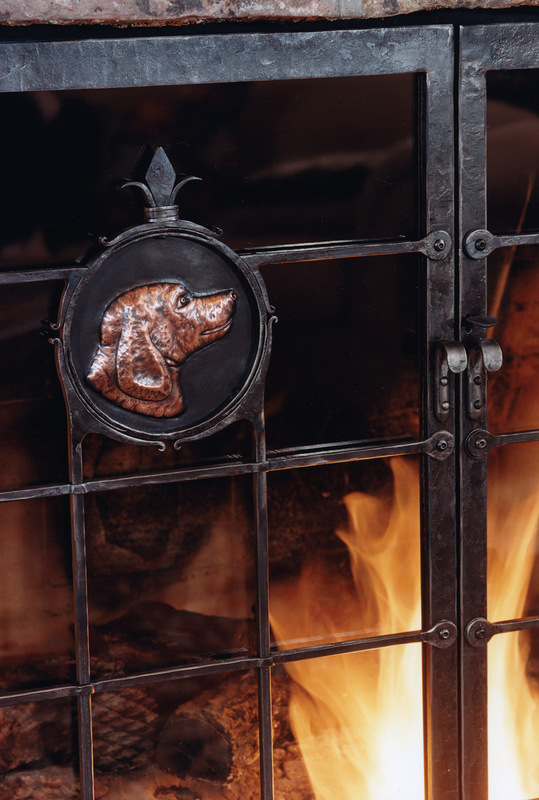 Glenn Gilmore’s fireplace screens reflect the interests and affections of his clients. Simple lines by Bar Mill Iron Forge frame the ceiling lights. 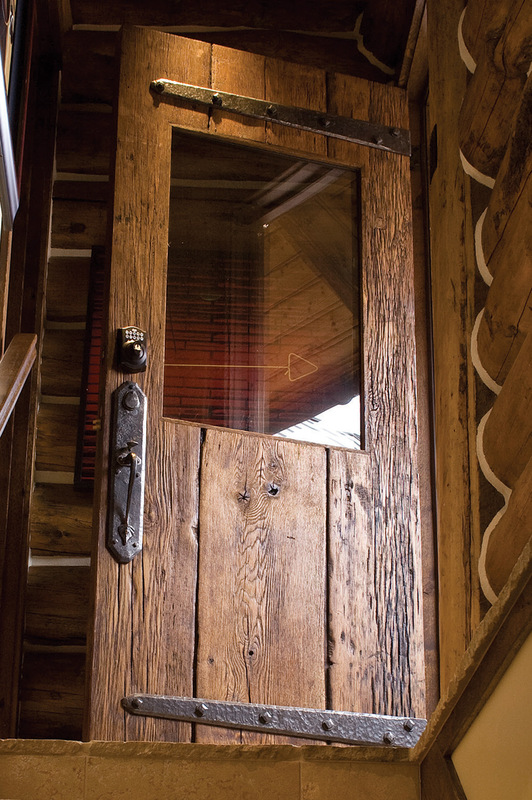 Decorative iron hinges and door pulls crafted by Gilmore complement the warm wood. 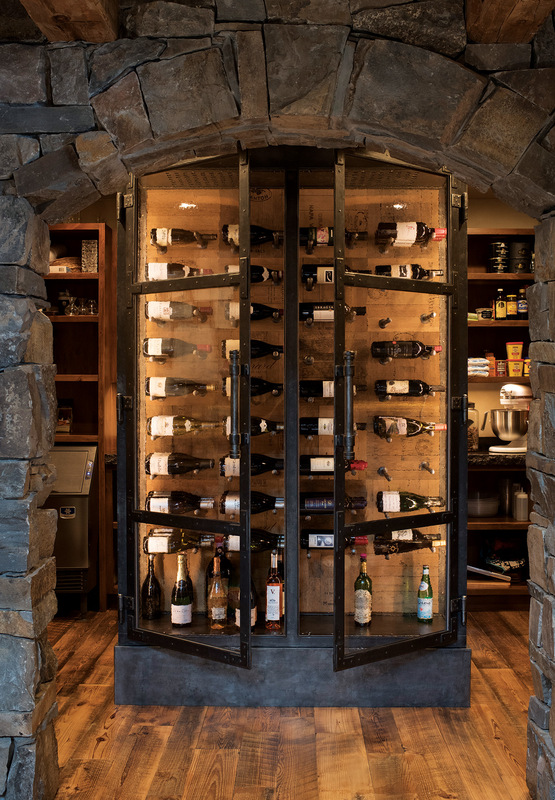 Iron-framed doors by Bar Mill Iron Forge complete the Old-World feel of this wine cellar. Gilmore’s metal branches, leaves, and acorns adorn a sink and mirror. 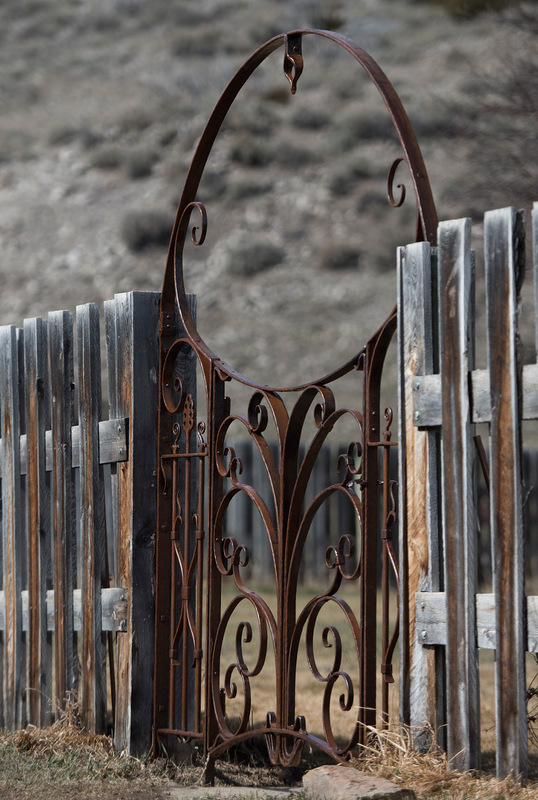 Curls and arches by Bar Mill Iron Forge contrast beautifully with the vertical repeats of a weathered fence. 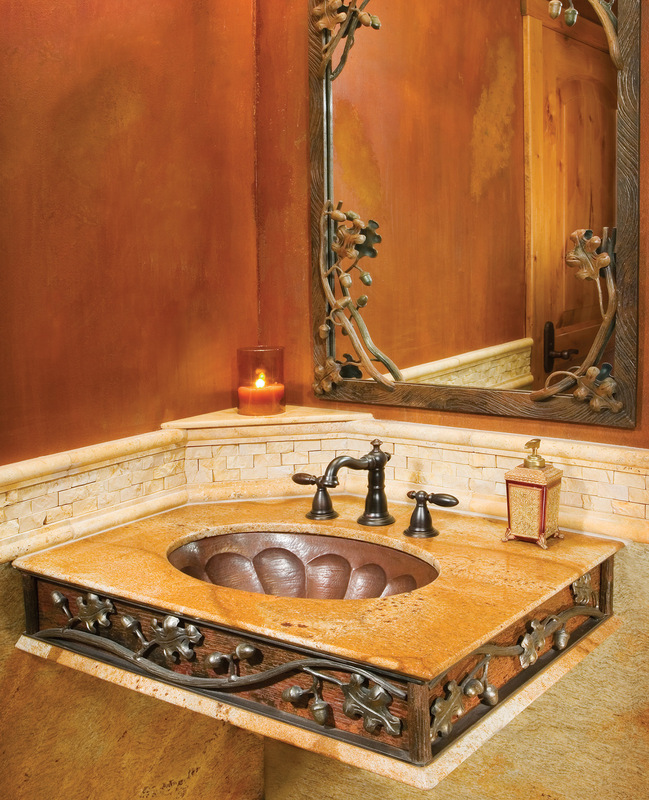 Traditional forms and more whimsical reflections of nature meld together in this balanced design with metalwork by Bar Mill Iron Forge. 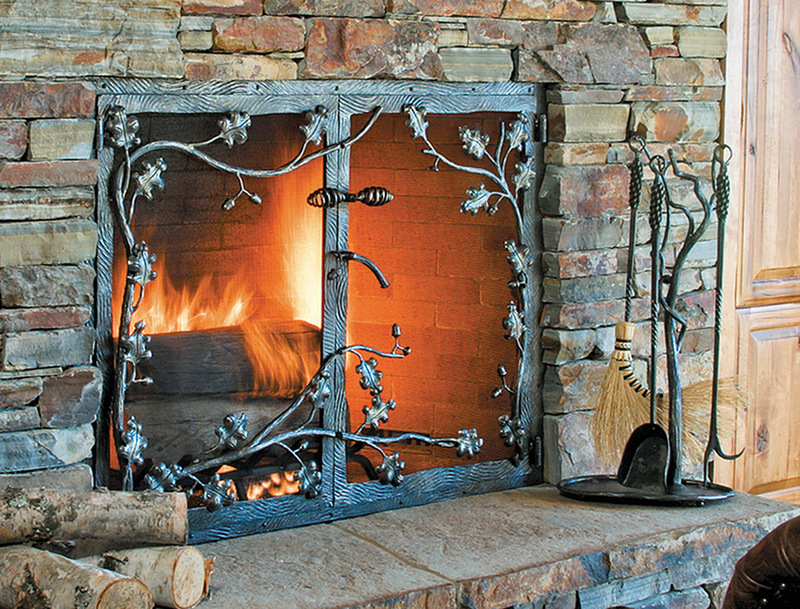 Gilmore’s delicate leaf work on a fire screen complements his hand-wrought fireplace tools that grace the hearth. 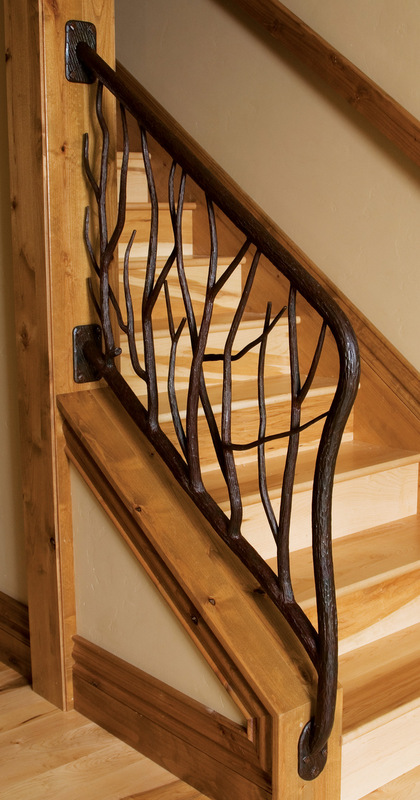 Gilmore evokes the patinas of nature with this stair railing. 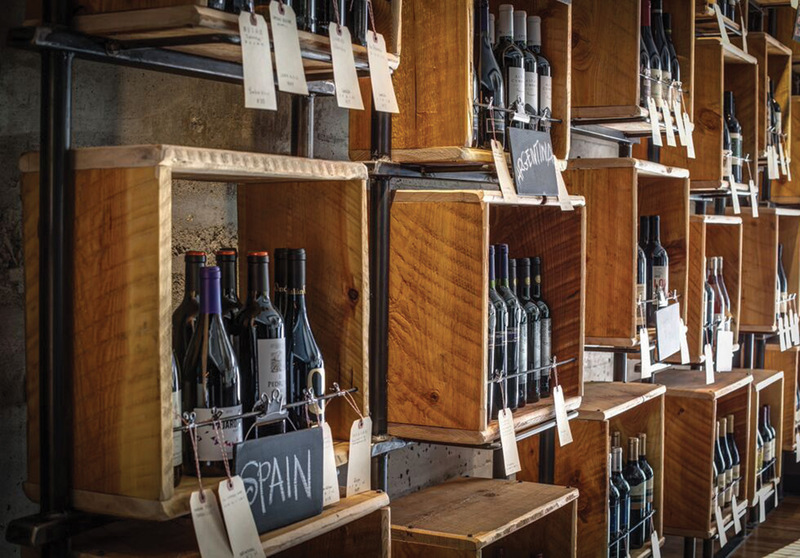 Chris McKeague’s iron and wood boxes serve as a focal point for a wine bar and tasting room in Helena, Montana.